What if one simple change could save you from heart disease, diabetes, and cancer? 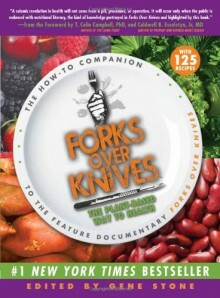 For decades, that question has fascinated a small circle of impassioned doctors and researchers—and now, their life-changing research is making headlines in the hit documentary Forks Over Knives. Their answer? Eat a whole-foods, plant-based diet—it could save your life. It may overturn most of the diet advice you’ve heard—but the experts behind Forks Over Knives aren't afraid to make waves. In his book Prevent and Reverse Heart Disease, Dr. Caldwell Esselstyn explained that eating meat, dairy, and oils injures the lining of our blood vessels, causing heart disease, heart attack, or stroke. In The China Study, Dr. Colin Campbell revealed how cancer and other diseases skyrocket when eating meat and dairy is the norm—and plummet when a traditional plant-based diet persists. And more and more experts are adding their voices to the cause: There is nothing else you can do for your health that can match the benefits of a plant-based diet. Now, as Forks Over Knives is introducing more people than ever before to the plant-based way to health, this accessible guide provides the information you need to adopt and maintain a plant-based diet. Features include: Insights from the luminaries behind the film—Dr. Neal Barnard, Dr. John McDougall, The Engine 2 Diet author Rip Esselstyn, and many others Success stories from converts to plant-based eating—like San’Dera Prude, who no longer needs to medicate her diabetes, has lost weight, and feels great! The many benefits of a whole-foods, plant-based diet—for you, for animals and the environment, and for our future A helpful primer on crafting a healthy diet rich in unprocessed fruits, vegetables, legumes, and whole grains, including tips on transitioning and essential kitchen tools 125 recipes from 25 champions of plant-based dining—from Blueberry Oat Breakfast Muffins and Sunny Orange Yam Bisque to Garlic Rosemary Polenta and Raspberry-Pear Crisp—delicious, healthy, and for every meal, every day. Books by Caldwell B. Esselstyn Jr.